Finally home after delayed travels and a soppy, rainy day. It’s also the night before the first day back at work and I figure it’d be nice to bring breakfast for the team in Room 5. Recipe makes 15 2-inch Scones. Pre-heat oven to 375 degrees. Line baking sheet with foil. Scatter butter and mix with dry ingredients. Add heavy cream to mixture. Add additional flour to dough, little by little, to roll into 15 circles. Place circles onto baking pan, spaced apart about 2 inches. Bake for 18 to 22 minutes or until edges are golden. When finished, remove from pan and let cool for 5 minutes. Melt remaining tablespoon of butter and brush onto each scone. 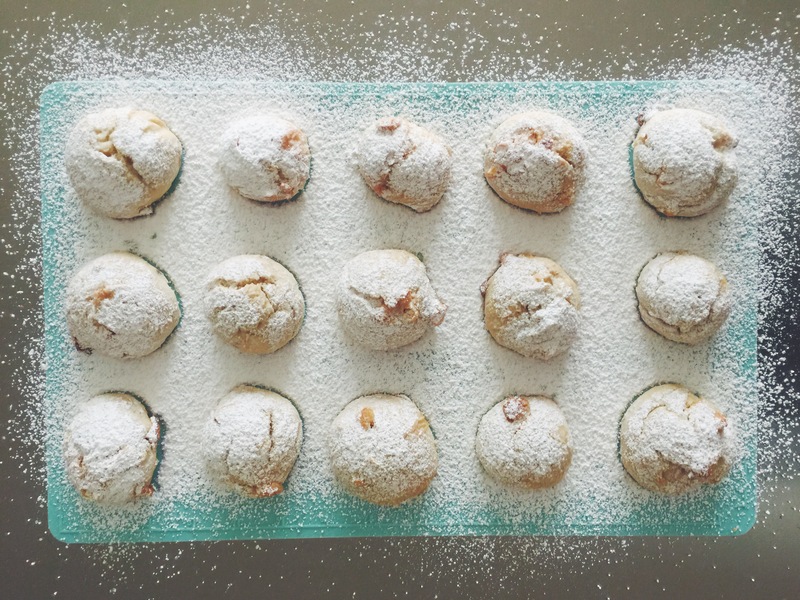 When dry, sprinkle powdered sugar onto each scone using a sifter or strainer. The recipe in this cookbook actually calls for dried currants, which we don’t have, and also never had before so I used what we had on-hand – bananas and chocolate chips. The bananas give the Scones a nice lightly moist quality, which Scones typically do not have. Maybe that’s why I enjoy these so much, I don’t feel really thirsty after I eat them. The next time I make Scones, I want to try making Blueberry Scones. Although, we did just acquire lots of apples and persimmons, so we’ll just have to see what I end up making next.